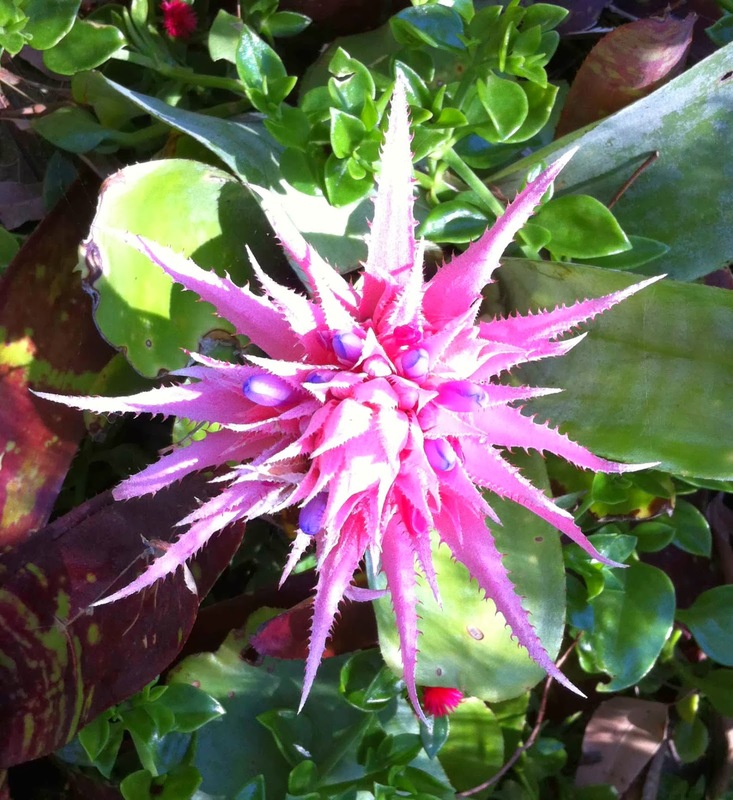 A Bromeliad to bring joy to the day. Many bloggers start off the new year with a word to guide them for that year and I'm impressed with their reasons for choosing. So many wonderful and meaningful words out there, but I think for me 'compassion' is probably the most important word, not just at the beginning of the year, but to live by, day in and out, always. (Oh dear, maybe I didn't sound too compassionate about the people who get bored! Fallen at the first hurdle!) However, I do try, and I despair at the apparent lack of compassion shown by my political leaders. And I should leave it at that, before I get out the soapbox. A Frangipani to sooth my ruffled feathers. Better late than never, I want to show you a couple of photos of the fabulous vegan Christmas dinner I had with Suzy, Tracy and Basil Beagle in Bundeena. Suzy invented a vegan Festive Roast to be sold in her shop 'Suzy Spoon's Vegetarian Butcher' - and was rushed off her feet with orders. We cooked one a couple of days before Christmas with my family at home and we all really enjoyed it, so I was looking forward to another a few days later. 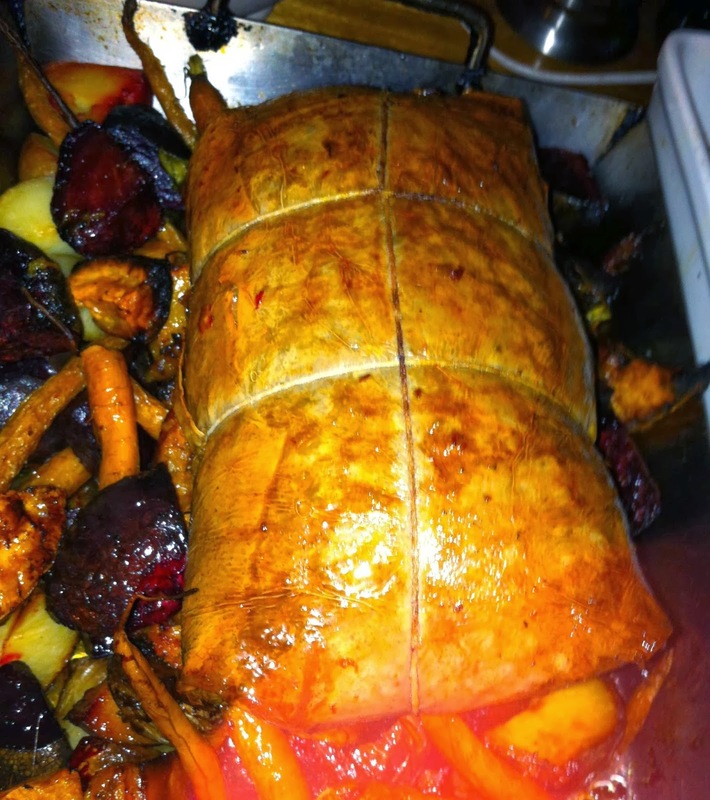 Baked in the oven with lashings of roasted vegetables - beetroot, potatoes, parsnips, carrots, sweet potato, pumpkin - and covered in gravy - this was a brilliant roast dinner and I must say I'm very, very proud of Suzy's creations. Beetroot glistening amongst the vegetables and the roast as it came out of the oven. 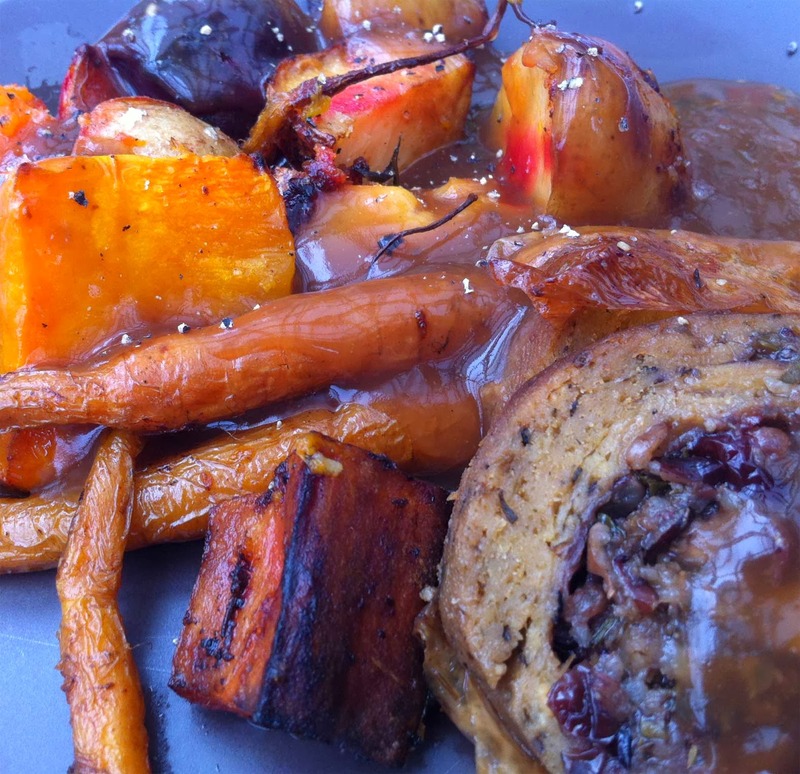 Slices of Suzy's Festive Roast, vegetables and gravy. This week at home has been pretty hot, though not as scorching as some parts of Australia. The garden has been in need of watering and as we have a lot of garden I've been kept busy shifting hoses. The preschool next door very generously (I think?) 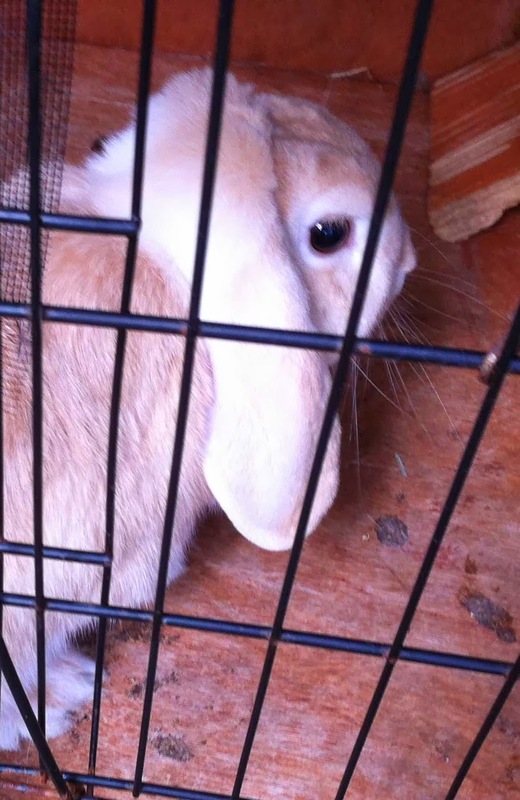 gave us two huge bunnies in a fancy bunny condominium, apparently for us to keep forever and ever. The children are thrilled, though Peggy, the Jack Russell, couldn't believe her eyes, and either quivers with excitement or hides and watches from afar. No decent photos so far because their pen has tacky mesh everywhere, but I'm going to inflict a couple of dodgy photos on you. 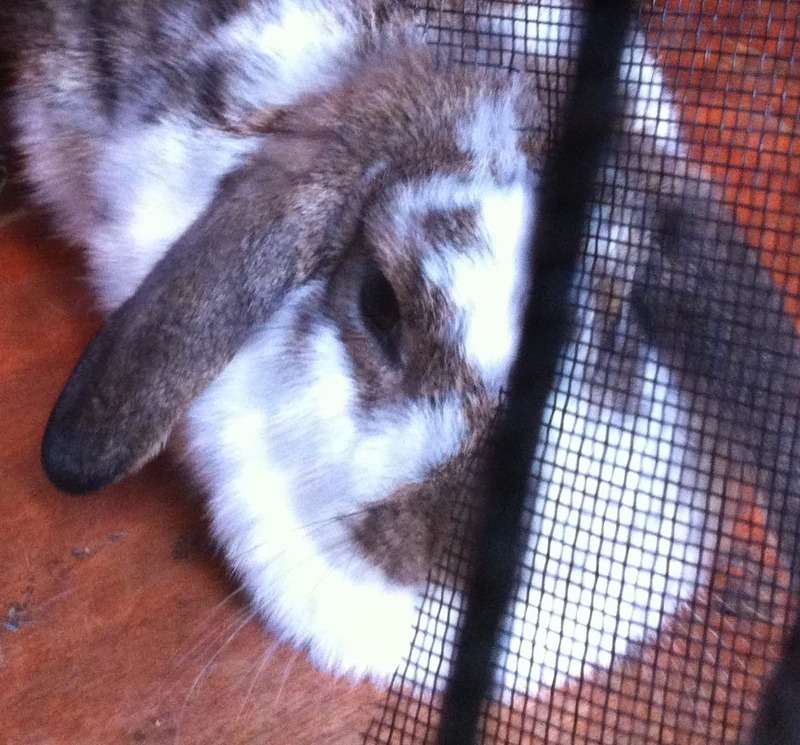 Big bunny, very pretty, very cuddly. Big bunny, also pretty but very stroppy. While I'm on the subject of guests, we had a visitation the other day. 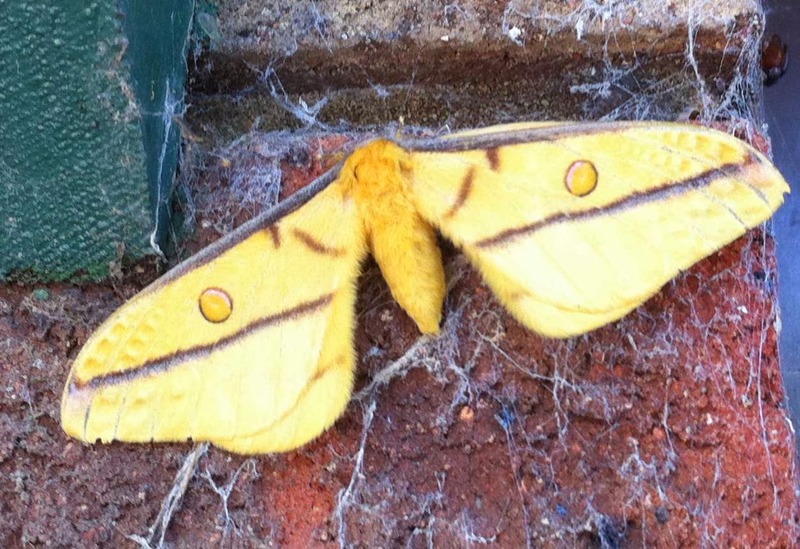 Two Emperor Gum Moths, huge, stunning, totally different colours. Just gorgeous. Yes, those are cobwebs! 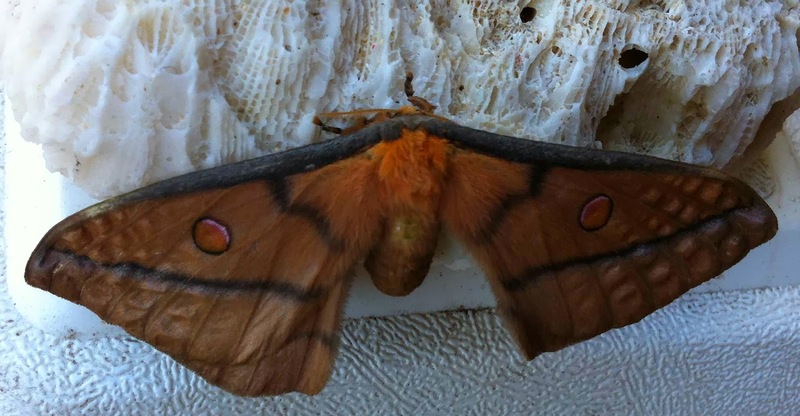 No danger to such big moths but a trap for small players. 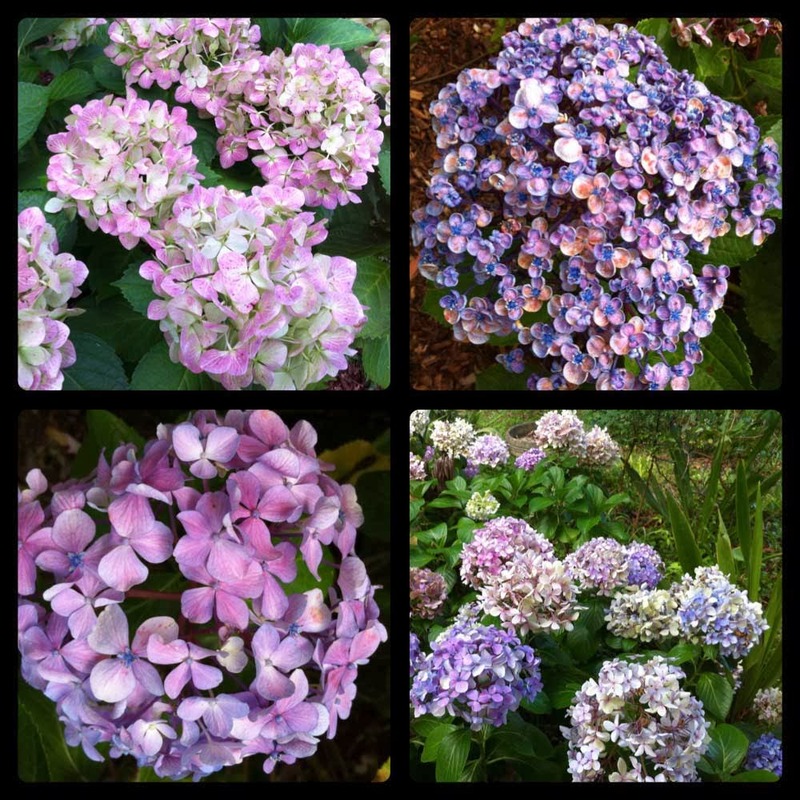 The garden is full of flowers but the heat has faded many of them, especially the Hydrangeas. 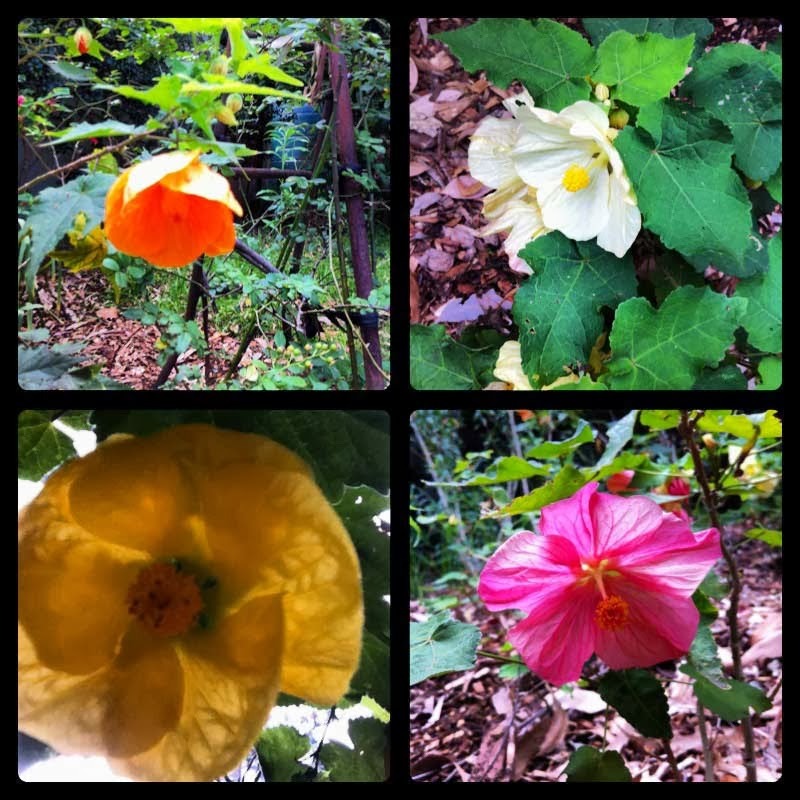 The Abutilons (Chinese Lanterns) are flowering though the chooks enjoy digging around them, moving the mulch and baring roots! Remember my blue cicadas? 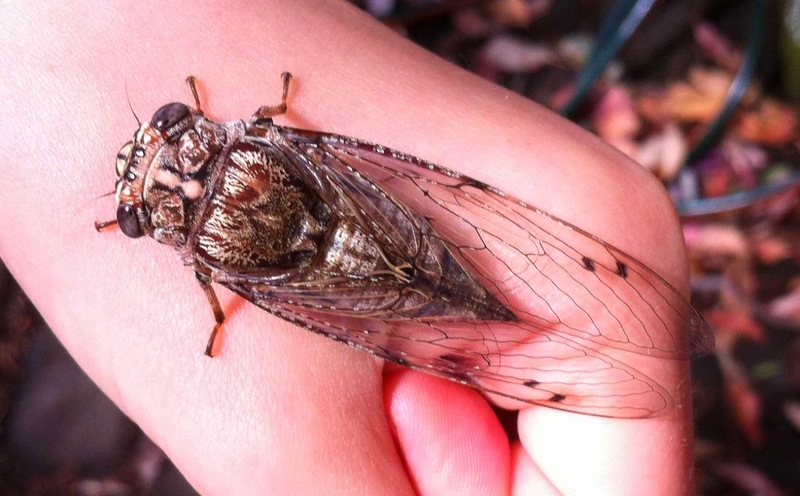 Strangely we have never seen a blue cicada in daylight, which makes me think they change colour as they dry out. This is what I think they become. 'Think' is the operative word until I have a proper discussion with my favourite entomologists. And Peggy gets the last word. 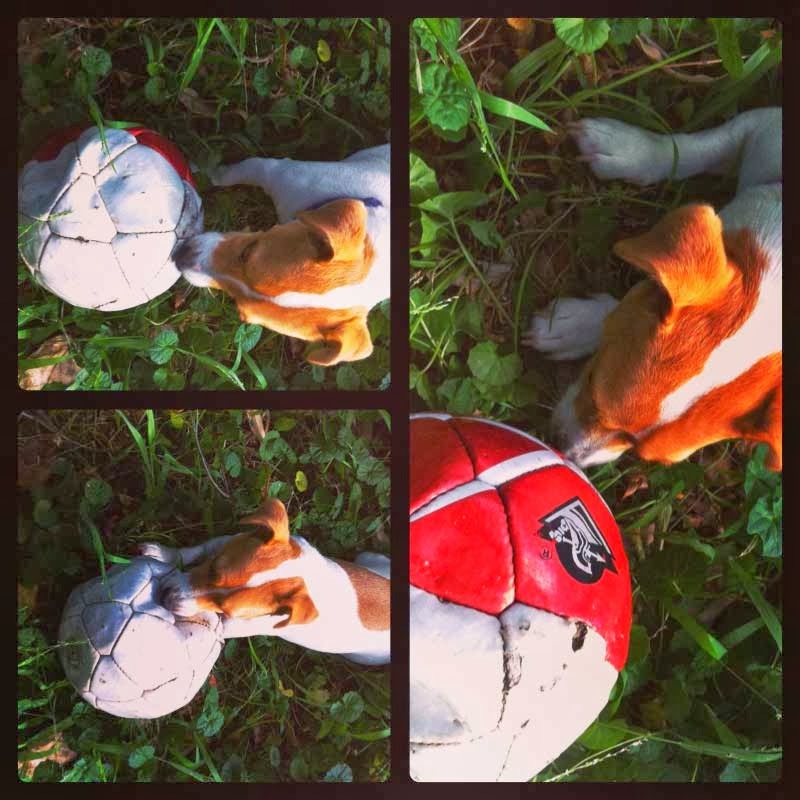 This is her ball and she proudly struggles to carry it around in her mouth. Have a wonderful 2014 and like Peggy, don't be afraid to take on something BIG this year. Love your word for the year. A wonderful thing to aspire to. And I don't think there is enough room on that particular soap box. Do you know any good builders? I think we need to build it high and wide and shout to the roof tops from it. Dear EC, ah, yes, compassion is what makes us human, I believe. I know you don't do FaceBook (and I only do to keep up with Suzy Spoon) but I do go on there with my heart on my sleeve. I just can't keep my nose out of politics. There's always room on my soapbox for you! Thank you. Perhaps we can dance as well as rant. I seem to have two left feet but I'd be delighted to dance with you, EC! Isn't it so important, Mo? We can't have love for the world without it. Happy New Year to you, Carol. Good to hear that you are so busy with happy things. - I just hope that you will find time for the many books to read you mention in your busy calendar. I am wishing you a good year 2014, with creative moments and busy ones, as well as lazy opportunities to just pause and enjoy. And since you chose compassion as your motto for the year (or just blogging, I am not sure I understood you correctly there), I wish you people around that appreciate and love you back. Happy New Year, Hilke! I know I'm lucky to be so busy but it's very different to the kind of busy life you have with your little ones. Enjoy these years, they grow up soon enough! I know your parents' problem, trying to cater for such different tastes. Maybe your sister could bring something that suits her, to make it easier. Happy New Year Barbara! Well, I do so enjoy sharing your blog, too, and seeing a glimpse into your life. That's one of the lovely things about blogging, getting to know friends from all parts of the world! And yes, being compassionate is not always easy, but worth the effort! p.s. I'm sorry I am dragging my links around with me. It's not something I do intentionally but is set up by blogger. If you turn off your backlinks in settings it will get rid of them. Just thought I would mention it was it has sometimes been a bit frustrating for people I visit. 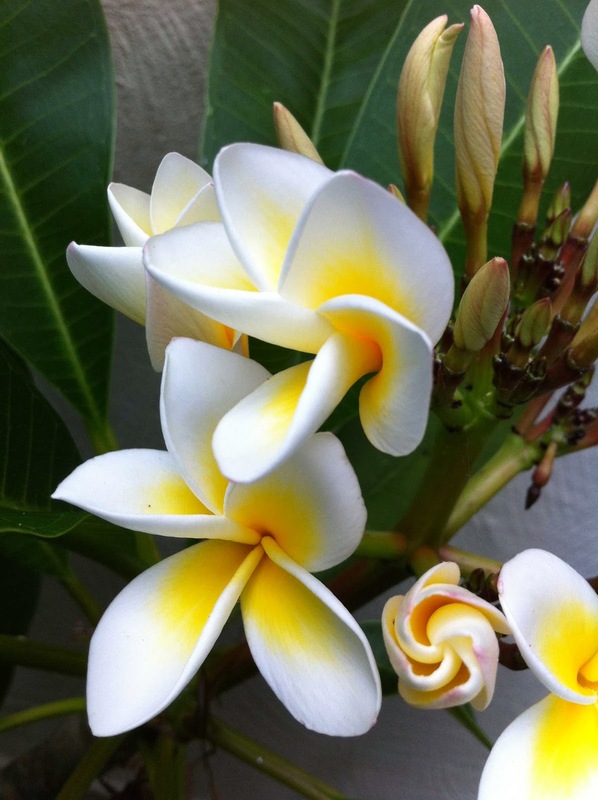 I like the Frangipani flower.